In all of my travels around this beautiful world, one of the most haunting sights I encountered was the sun slowly rising over the intricate sculpted stone pagodas of the temples at Angkor Wat. 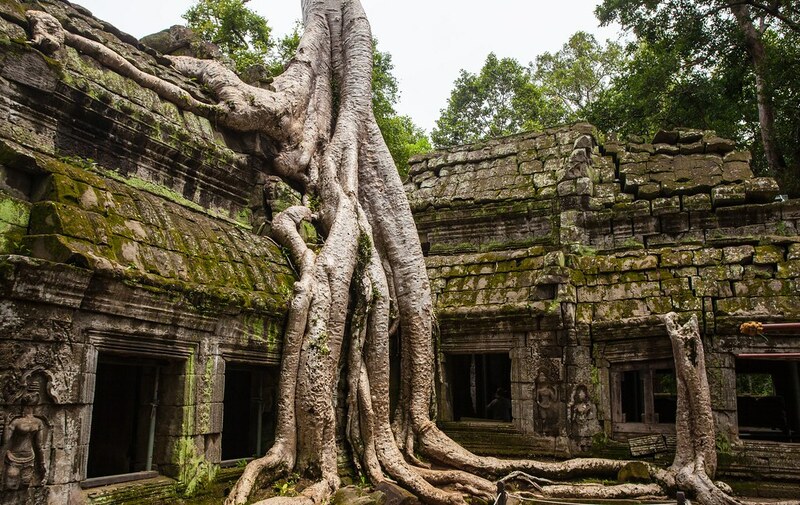 A standout amongst the most prized religious sites on the planet, temples of Angkor are a true world wonder. A fundamental piece of any Cambodia itinerary, Angkor Wat enraptures guests with its stunning magnificence and unfathomably saved social legacy. Angkor Wat is a temple originally built to the Hindu god Vishnu as the king’s state temple and then his mausoleum. In later years it was converted into a Buddhist temple. It’s important to know that Angkor Wat is simply one of the temples within the greater Angkor Archaeological Park, home to hundreds of temples and spanning 1,000 square kilometers. The entire Angkor site is inscribed on the UNESCO world heritage list for its incredibly preserved remains and deep cultural heritage. The most direct way to reach Siem Reap and Angkor Wat is through Siem Reap International Airport outside the city. 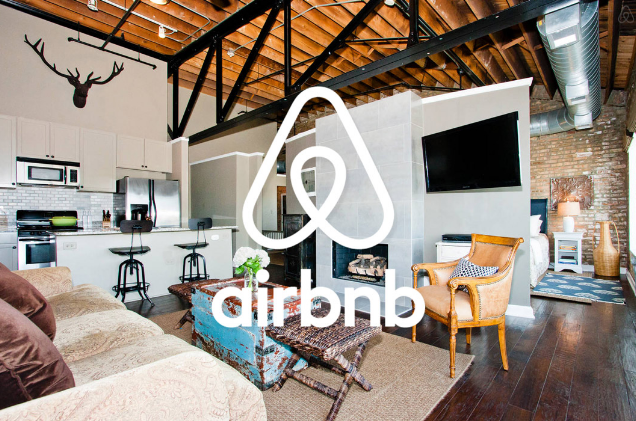 If you are already in Bangkok, you can reach Siem Reap by bus, taxi or train. Many followers had asked me if it is possible to visit Angkor Wat in a day. Honestly, one day would not be enough to see everything. Angkor Wat complex is huge! However, if you only need to see the best of Angkor Wat, then it is completely doable within the day using a day pass that costs $37. You need to decide whether to go on your own, hire a tuktuk or join a tour group, either way you’ll see the highlights within the opening hours of the Angkor complex by doing the ‘small circuit’. Whatever you wear, be sure you cover your shoulders and your knees. It’ll probably be hot and humid, and depending on when you go it may rain, so try to drape yourself in cotton things and bring an umbrella. Yes, it’s going to be crowded and yes, it’s been talked up for years – but even so, Angkor Wat is going to surprise and impress you. It’s no surprise that this temple is the most visited and most photographed. After sunrise, take your time exploring the massive complex and its 2 600 feet bas-reliefs depicting famous battles and scenes from battles. Once inside you can wander around temple or the grounds. You can also climb the steep set of stairs to the temple in the center of the complex. There is usually a queue to get in as the number of people that are allowed at a time is restricted. This area does not open until 6:40am and it is one of the few areas in the park where the conservative dress code is enforced. This is the famous temple that was used as a set for the movie Tomb Raider. Paramount was charged $10 000 per day for seven days to film those iconic scenes. Visit this temple in the early morning, as the harsh afternoon light will ruin your photos if you are shooting with a camera phone or a standard stand and shoot. 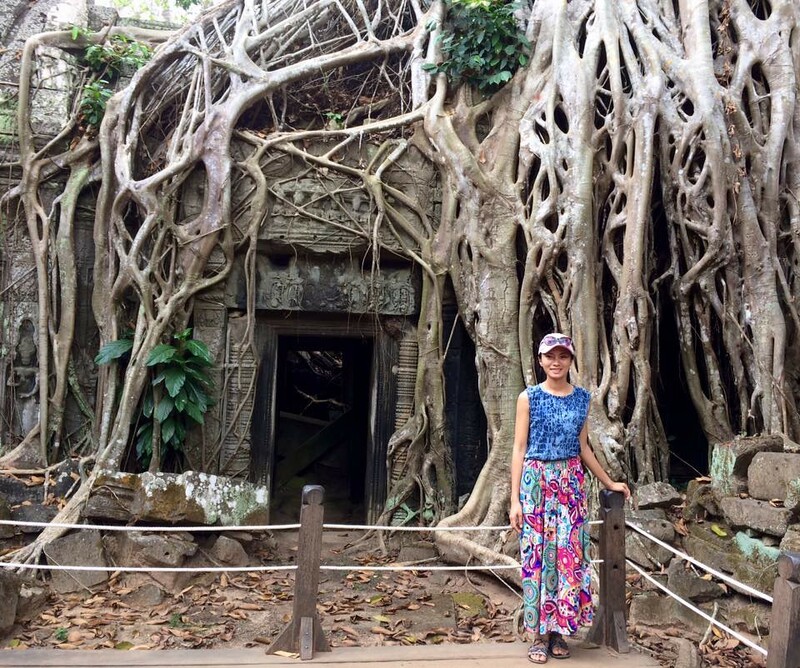 I really enjoyed Ta Prohm because of the trees but also because a lot of it was not in tact. Due to the decay or destruction of Ta Prohm you really become aware that you are walking through a lost civilization from centuries before. Banteay Kdei is a beautiful temple that seems to be a bit structurally unsound. Look closely at the columns and walls here, you’ll see that many are being held together by rust-colored wire. Some areas look like they are ready to topple at any moment! Take your time here, the carvings are really spectacular and it’s not as crowded as some of the more popular temples. The name Banteay Kdei literally translates as “a citadel of chambers” and you’ll find plenty of crumbling hallways and chambers to explore. Finally, don’t miss the enormous tree at the back of the temple that is taking over a small retaining wall. At first, it looks like a mountain-sized pile of stones then you realize – holy heaven!– there are over two hundred faces watching you from every surface of the temple! 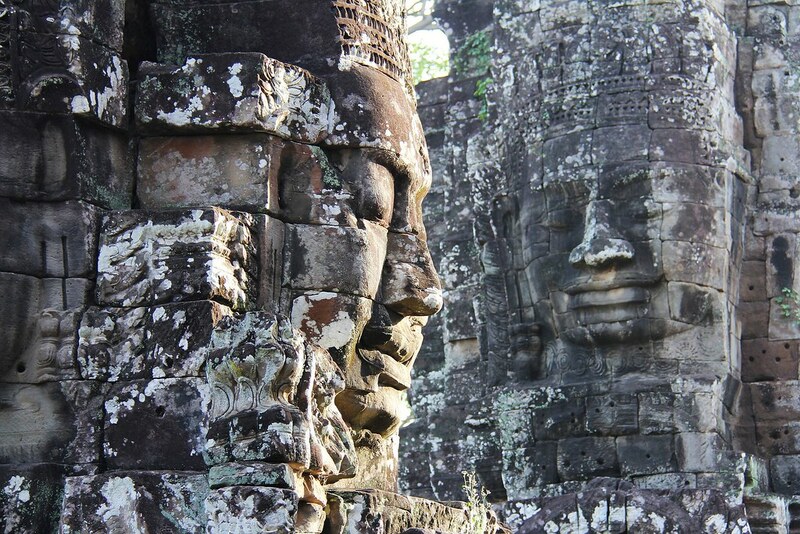 The centre of the squarish Angkor Thom is the enigmatic “face-tower temple” called Bayon. It is famous for its delightful carvings of enourmous size, too, with huge battle scenes and small depictions of everyday life. North-east of the Bayon is the 150 years older Baphuon, besides Angkor Wat and Bayon one of the three largest temple mountains or pyramids of Angkor. It is almost completely the result of an elaborate scientific reconstruction work with its original stones, finalized in 2011. 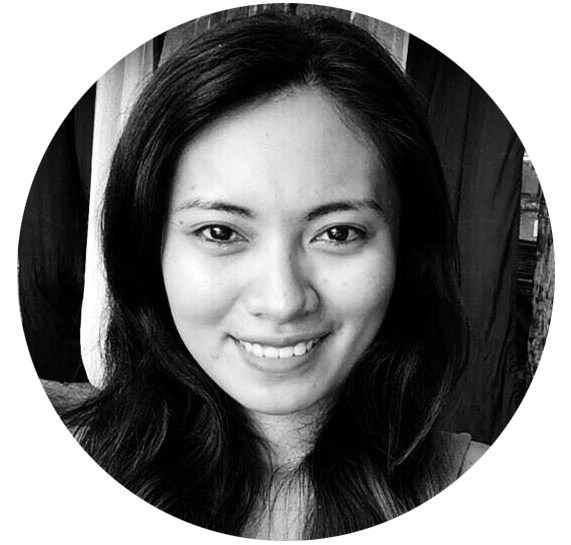 Thommanon and Chau Say Tevoda are situated directly across the road from each other. They are both very small temples, which only take a little while to explore. I enjoyed seeing them because it’s interesting to see that not all the temples of the capital Khmer Empire were giant temples. 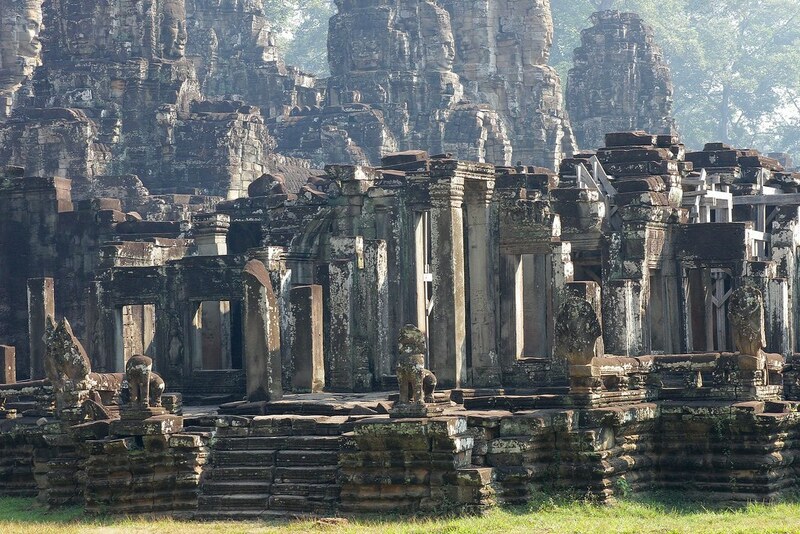 Ta Keo is really interesting to see because it was never completed and is currently undergoing preservation. As you walk around, you will see scaffolding on parts of Ta Keo. Many temples undergo restoration to keep them intact or to make sure the structure is safe for visitors to walk around and climb. 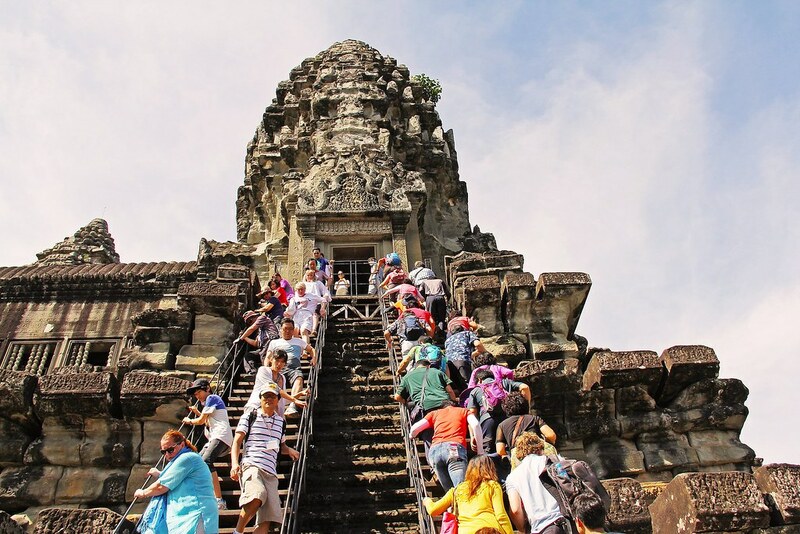 Ta Keo’s staircase is very steep so watch your step as you climb up the 72 feet to the top. 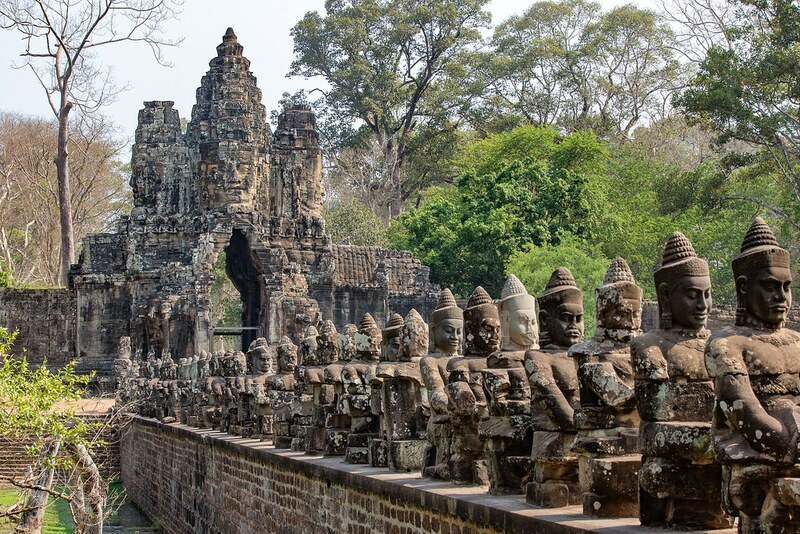 Heading back to the main road through Angkor Thom you will find the magnificent Terrace of Elephants. 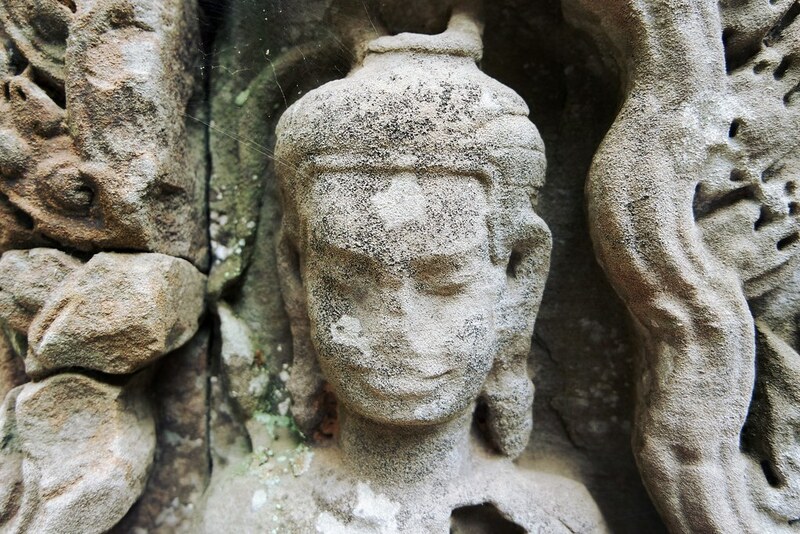 Built in the 12th century by King Jayavarman VII it is 300 meters long and 3 meters high. If you walk along the front you will see all the types of animals caved into the stone face with some lovely carved elephants. The elephants also frame the sides of the staircases. At the northern end of the terrace is another terrace called the Terrace of the Leper King. No matter how ornate, vast, symmetrical, plain or architecturally complex the Angkor Wat temples are, each one is marvellous in its own rite. If you have any energy left you can ask your driver for one final stop at the small temple of Prasat Kravan. If you’re feeling a bit templed-out, don’t feel bad about skipping it and heading straight back to town for a cold drink and a dip in your hotel pool. You’ve earned it!